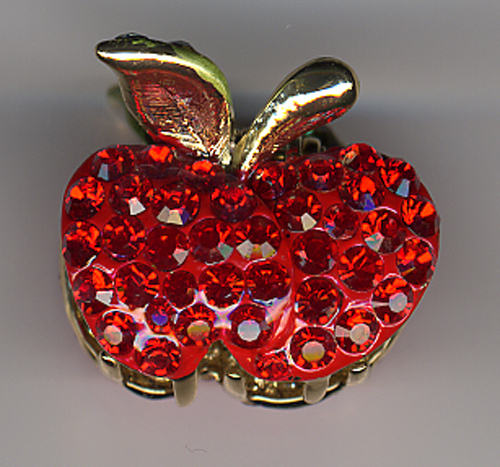 Medusa's Heirloom Hair Accessories brings you bejeweled vintage hair clips, combs, jaws and pony tail holders with an updated look. Hair accessory sophistication at its finest. The Heart Tong is encrusted with clear crystal stones in a ribbon pattern and a heart at the end with larger stones. Spring action clamp will hold a very thick piece of hair. 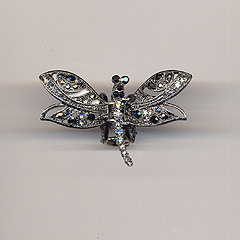 This gorgeous clips easily into a small lock of hair anytime you want to add sparkle. Shown in Clear/Smoke, only available in solid clear. Circle size: 1.5". 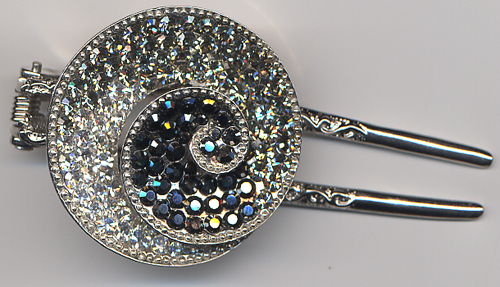 This gorgeous barrette is in silver metal completely encrusted with Swarovski crystals. Secure "pinch release " closure. Size: 3.75" x 2.5". The X-Large Swarovski wraps are almost double the length of the regulars. Better for layering necklaces. They wrap around your wrist or neck and are one size fits all! Perfect for all ages, great gift items or to layer with your existing jewelry. 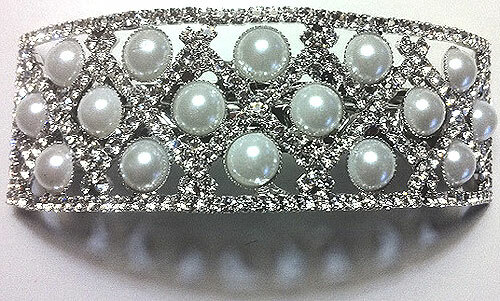 This gorgeous gently arced barrette is perfect for the bride or any formal occasion. Pearls sit between lattice encrusted with Swarovski crystals Secure "pinch release" closure. Size: 4.25" x 1.25". This is the hottest jewelry item on the market right now. They wrap around your wrist or neck and are one size fits all! Perfect for all ages, great gift items or to layer with your existing jewelry. 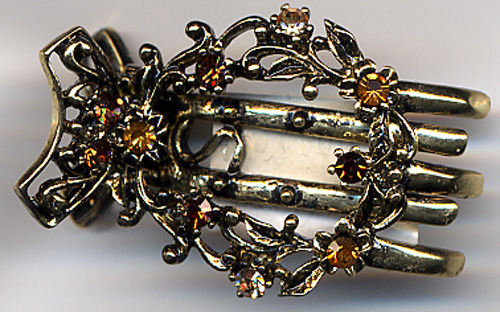 Beautifully encrusted barrette with glistening amber stones throughout. Spring closure . 1.5" x 4". 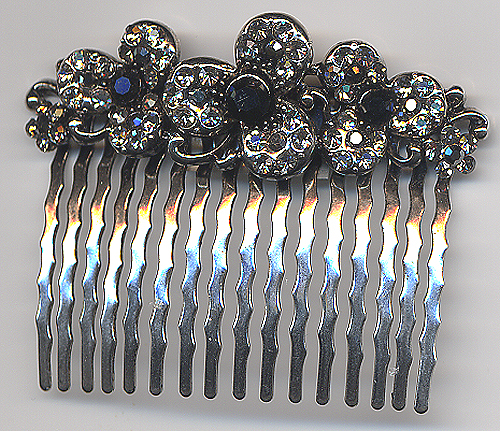 This floral crystal comb will set any updo apart. 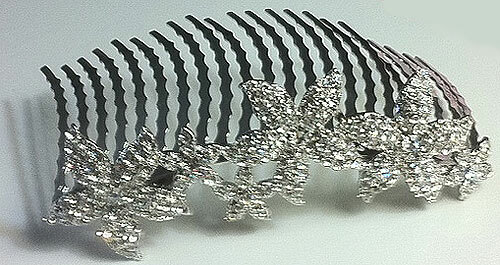 Perfect for the bridal updo of Swarovski encrusted flowers on waved tines measuring a full 2.25" for a secure feel. Size: 3.75" x 1.5".